I’m not really great about timing when it comes to giving Toyota much-needed advice about their sub-brands. My big plans to save Scion came less than a month before they dropped the brand entirely, and my latest great idea about the Previa comes a solid 18 years too late. But I don’t care. Because I know, deep down, that if Toyota had spun off their mid-engine minivan into a brand unto itself, it would have been amazing. Let’s just refresh everyone about how fantastic the original Previa minivan was, so we’re all on the same page here. The original Previa came out in 1990, and was a development of Toyota’s previous mid-engine minivans, the LiteAce-TownAce-HighAce vans. The mid-engine design used in the Previa was chosen because it allowed for some incredible packaging, where nearly all the mechanical bits were below the floor and the entire length of the vehicle could be used for people or cargo – the holy grail of minivan packaging. The Previa’s chassis design was astoundingly clever, sticking the engine horizontal and nearly flat near the middle of the wheelbase, but still managing to have accessories and cooling system components easily accessible under a front hood, thanks to the use of a special second driveshaft just to handle things like the alternator, cooling fan, and, yes, even a freaking supercharger. They called the system “Supplemental Acessory Drive System (SADS),” and I’m not sure there’s ever really been anything like it. The end result of all this clever engineering was a mid-engine platform that could have a supercharged engine, and could be either RWD or AWD. It’s the same description you’d give for the layout of a car like an Audi R8, but instead it’s an affordable, spacious minivan. 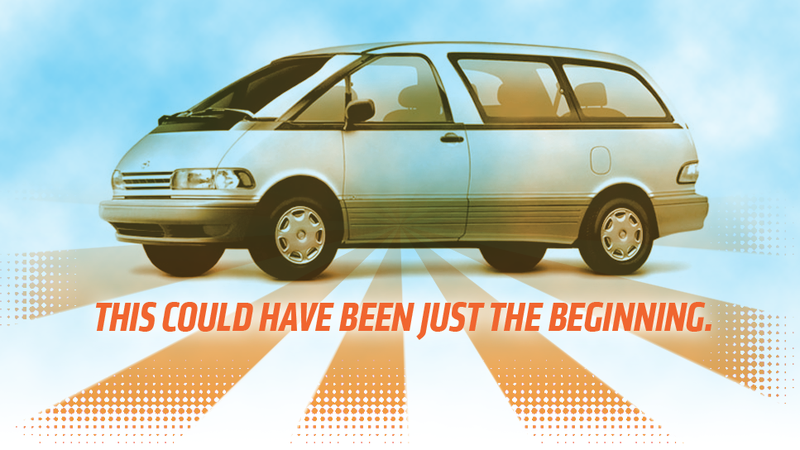 For all the engineering work that went into this novel platform, Toyota only used it for one model: the Previa minivan. Using a bespoke platform for just one product is never ideal for a mass-market car company—though it was common in the 1980s and early 1990s Japanese Bubble Era when cash and, likely, cocaine flowed like water. But it was in considering this issue that I had a realization: the Previa should have been an entire family of cars. And all the cars in the Previa brand should have shared the same remarkable mid-engined platform. Toyota could have pitched the Previa brand as a sort of enthusiast’s brand. A smart, iconoclastic brand, sort of similar to the niche that Saab and Subaru held for so many decades. A brand sort of like what Mazda is now, and what Lancia used to be, in Europe. It would be a line of cars that would offer interesting engineering, sports car-like handling, and somehow also rational practicality, all at the same time. Previa as a brand could have been the ultimate Jalop brand, if they’d done it right. • A Previa premium sedan, the only mid-engined sedan on the market; maybe ever? This would be a sedan that would have competed with BMWs, emphasizing performance and handling. The Previa sedan would be offered with the supercharged engine and a choice of RWD or AWD. Thanks to the mid-engine layout, the Previa sedan could have trunks at both ends, like a Volkswagen Type III or a modern Tesla. • A Previa wagon, much like the sedan but, you know, a wagon. Don’t forget the trunk and the wagon area! • A Previa two-seat sports car. This would really take advantage of the mid-engine layout, and there would be hardtop and convertible versions. Yes, the MR2 existed at the same time, but would you really say no to a brand with two mid-engined sports cars? Of course not, because you’re not an idiot. The Previa brand wouldn’t be a mass-market brand like Toyota; Previas would be something of a premium brand, but not in the same way as Lexus is. Where Lexus is more about status and conventional luxury (leather, blingy chrome crap, lots of buttons on the dash), Previa is more targeted to an enthusiast, a buyer who’s a noncomformist who appreciates interesting engineering. Sure, there’d be challenges: the layout does not lend itself well to easy servicing or tinkering, though Porsche seems to have found that’s something their customers will live with, for their mid-engine cars. Also, that center tunnel would be pretty wide on the non-van members of the Previa family. Since the floor would be lower than on the van, the upper part of the engine would be between the front seats, so clever interior designing would be needed to make the wide center tunnel a design feature as opposed to a liability. I’m pretty sure this could be done; there’s lots of things that could be done with a flat area between the seats, from cupholders to nice armrests to flat desk-like areas. I’m sure some up-and-coming mid ‘90s Toyota interior designer would have risen to the challenge. The engine options are limited to the one basic 2.4-liter four, with the optional supercharger. This engine could make up to about 160 HP , which would actually have been pretty competitive at the time. Still, at some point, more powerful engine options would likely need to have been available. I’m pretty sure, though, that if Previa was spun off into its own brand, such engine options would have come. Toyota could have gone from selling one basic model on one of their most advanced and innovative platforms to selling five different models—that seems like a much better amortization of the development costs to me.